Black and white combination is timeless, elegant and there is no person who doesn’t love it. Because of its maximum contrast, this color match instantly draws the viewer’s attention. 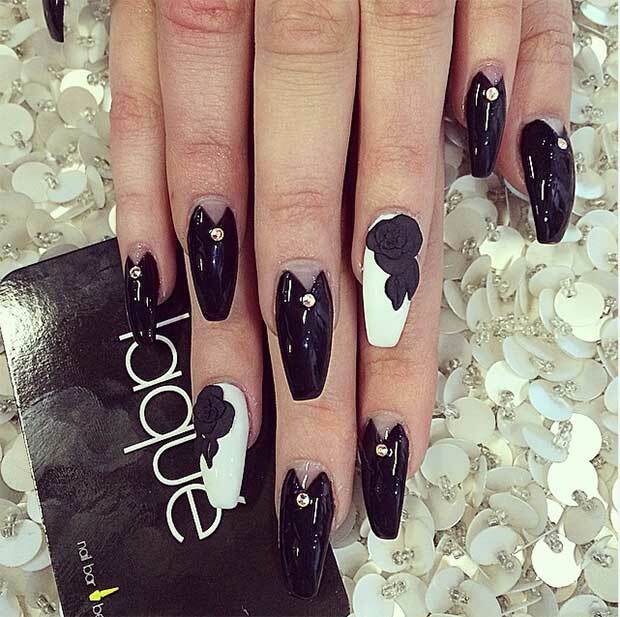 After that being said, the reason why we love black and white nails is obvious, right? 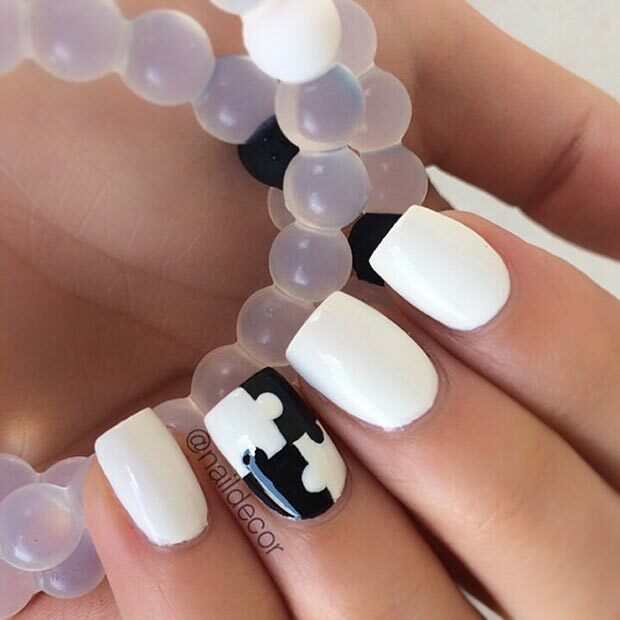 Classic black and white nail design doesn’t have to be boring. Although we are using only two colors, there are lots of options and variations. 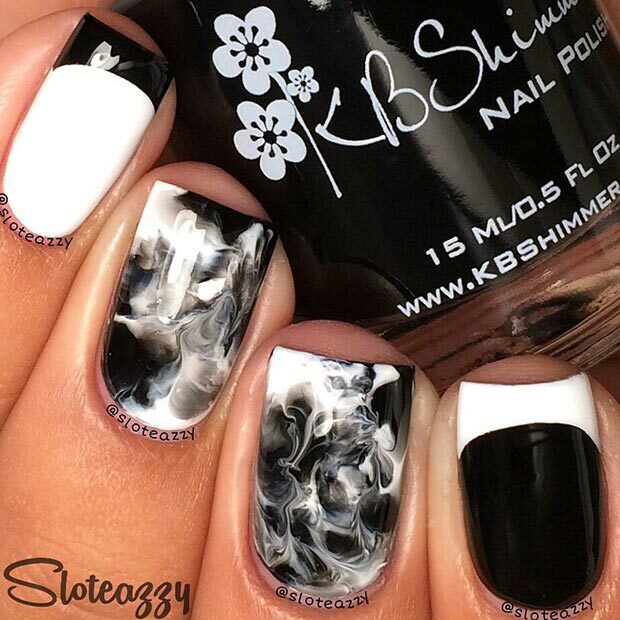 Check out our list of 50 best black and white nail designs and see it for yourself. You cannot go wrong with these two opposite colors. Gradient or ombre technique is one of the most popular nail designs this season. The secret weapon for this method is makeup sponge. 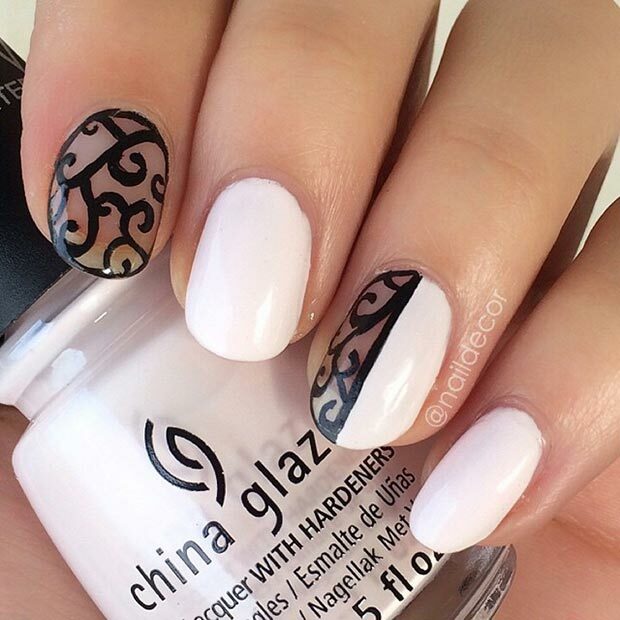 Once you’ve mastered this technique, you’ll be able to wear the gradient look on their own or combine it with other techniques like freehand nail design or stamping. Some women might be against putting religious symbols on their nails but either way, this nail design looks great and is easy to make. Animal print is always trendy. 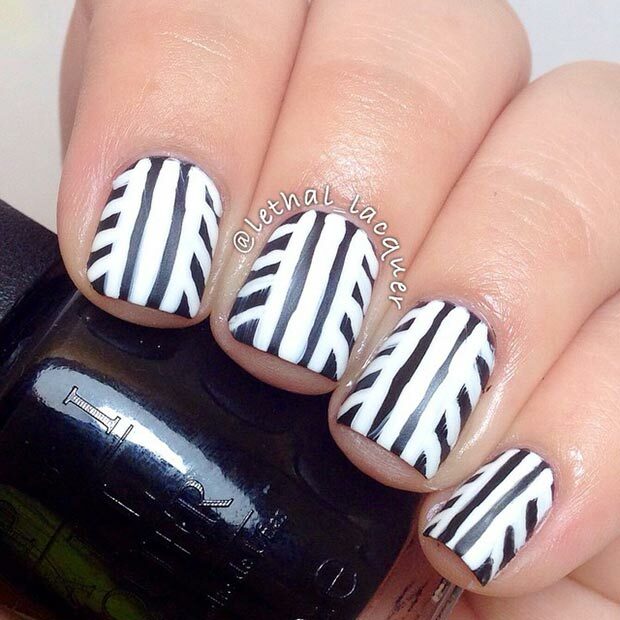 Spice your zebra nail design with some black and silver studs on the accent nail. 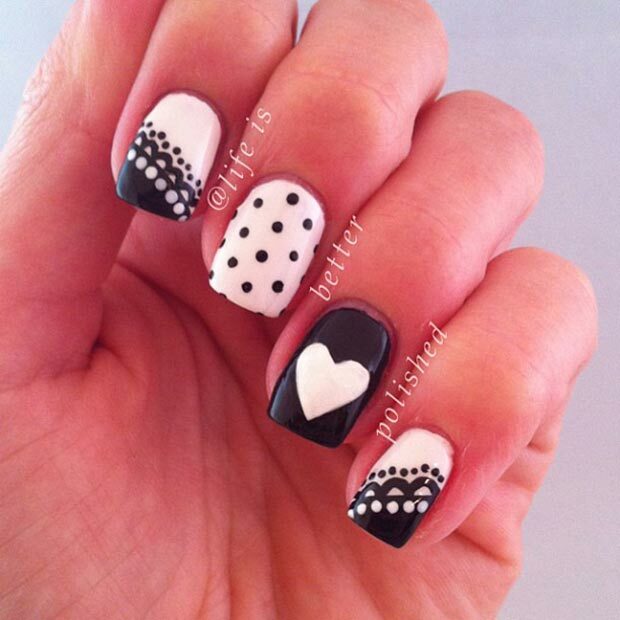 Although this cute nail design is in black and white, it will certainly brighten up your mood and day. The classic French manicure is a timeless look but over time it can become pretty boring and dull. To avoid the boredom of wearing the same look all over again, we recommend this improved French nail design with black tips. It’s still sophisticated but more modern. 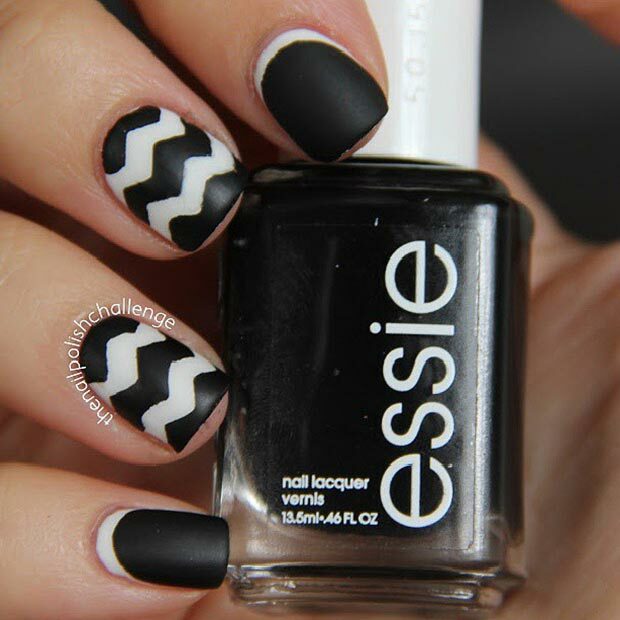 You can’t go wrong with a black and white chevron pattern. This look is the definition of smooth and stylish. 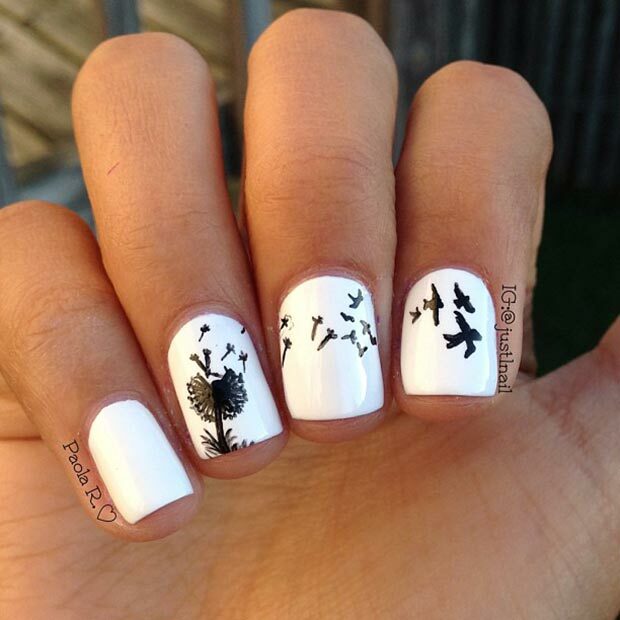 Dandelion nail design is perfect choice if you want something sweet and soft on your nails. Start with a white polish as a base coat, and use a nail brush for drawing. Don’t forget to make a wish! 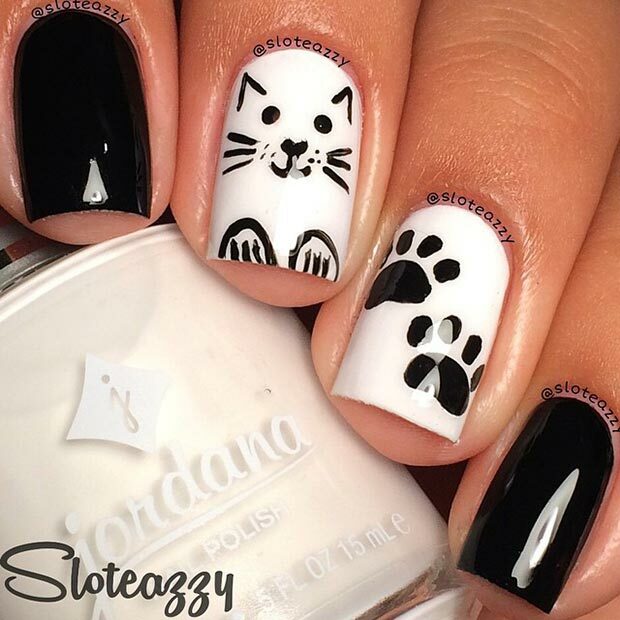 Even if you aren’t a huge cat lover, you must admit that this nail design is super cute. Meow! Googly eyes aren’t only reserved for Halloween. This sweet mani can be rocked through the whole year. Apply your favorite black polish as a base coat and let it dry. Create white parts of the eyes with bigger end of a dotting tool and black parts with a smaller one. So simple and easy! Want to have some fun while doing your nails? If yes, splattered nails are for you. 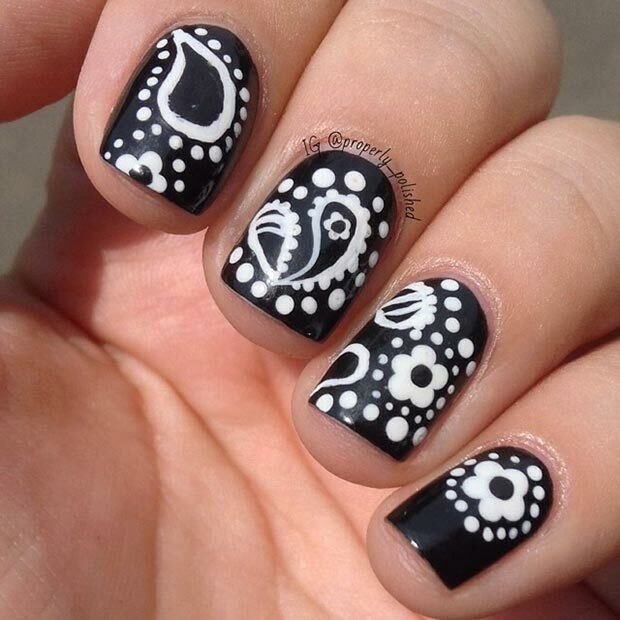 This nail design is definitely easy but can get a bit messy, too. 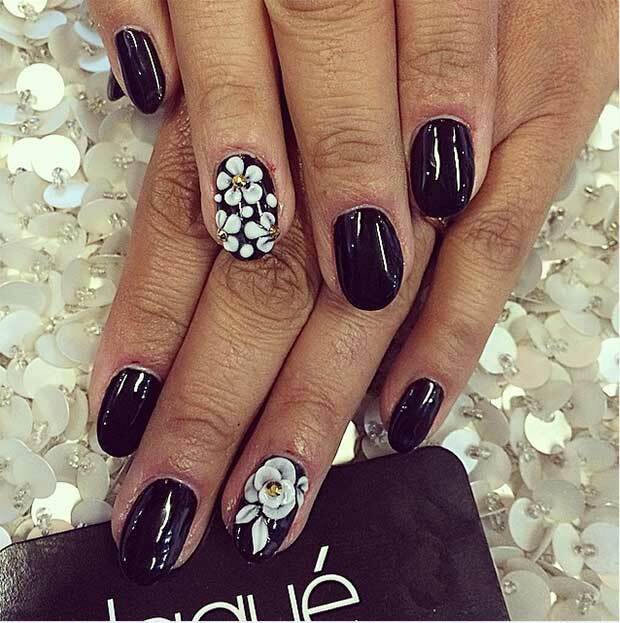 Perfect nail design for staying on trend. 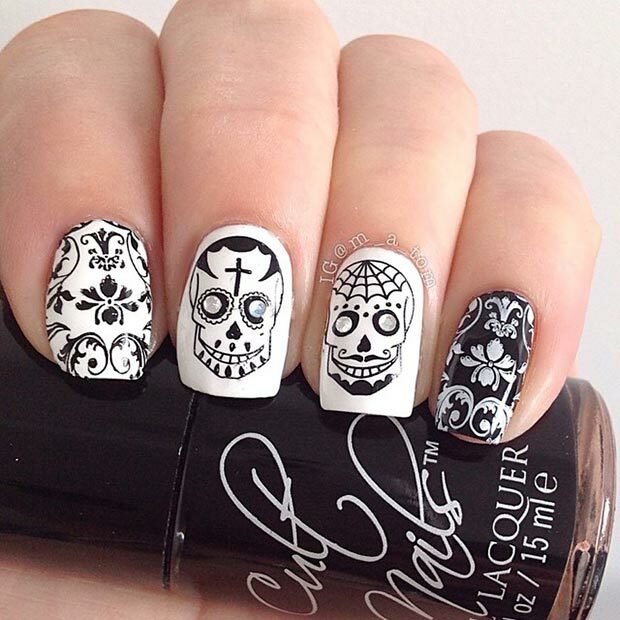 You definitely have to try these nails! 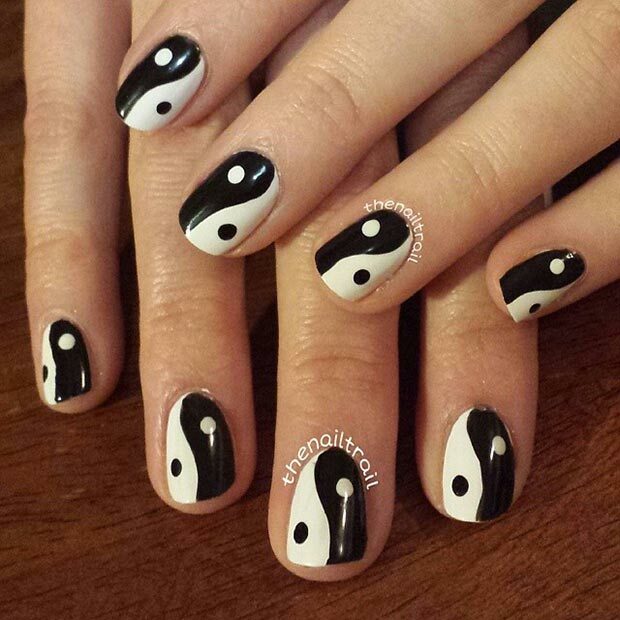 The most popular nail design in black and white is definitely Yin and Yang. 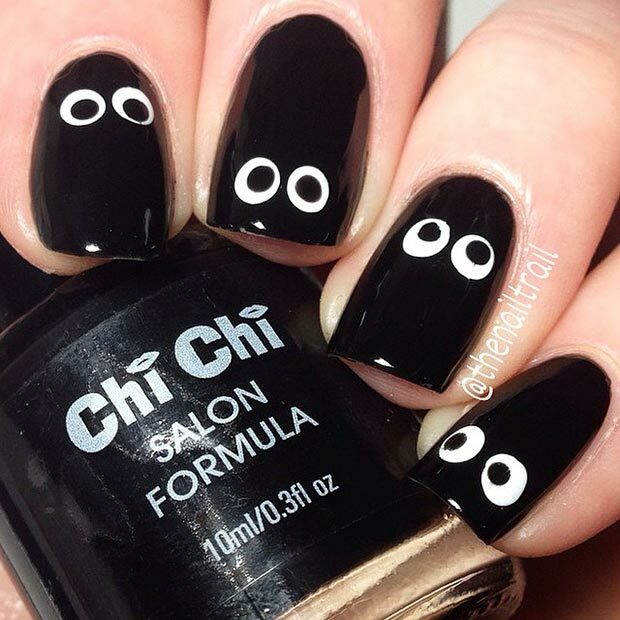 Not only nails look gorgeous, but they also help harness your inner chi. This nail design is attention grabber! You don’t have to be super artistic to be able to do houndstooth nails. Diamonds are a girls best friend! 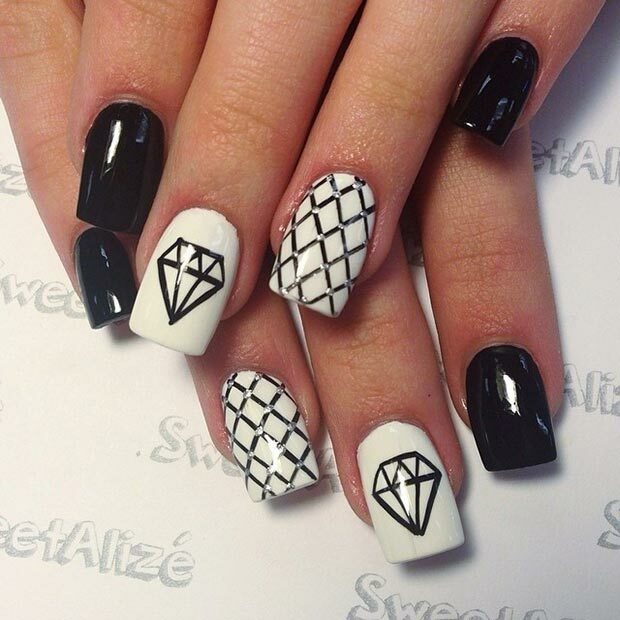 Unfortunately, not everyone can afford a diamond on their finger but… you can always draw one on your nail! Close enough, right? To recreate this trendy, playful look, you need steady arm and some extra time. It’s worth it because the end result is amazing! 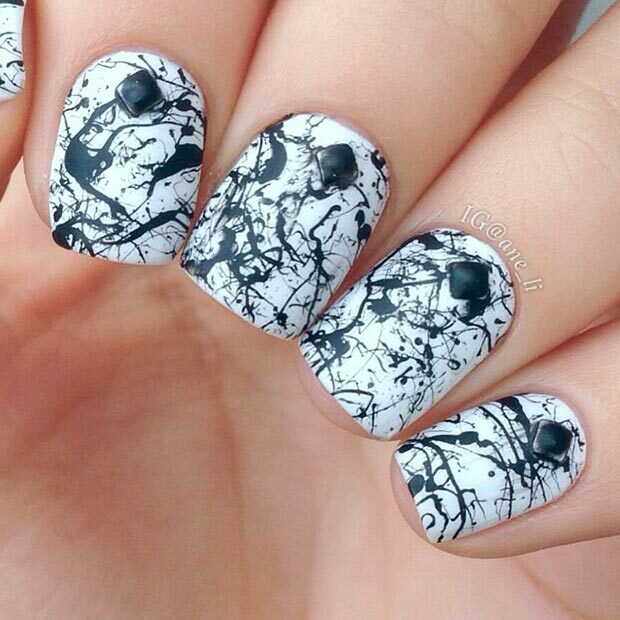 Another version of splattered nail design but less ‘messy’ one. Which one do you like better? Using dotting tool for nail art makes this puzzle design easy. If you want to try out other color combination on your accent nail – go for it! 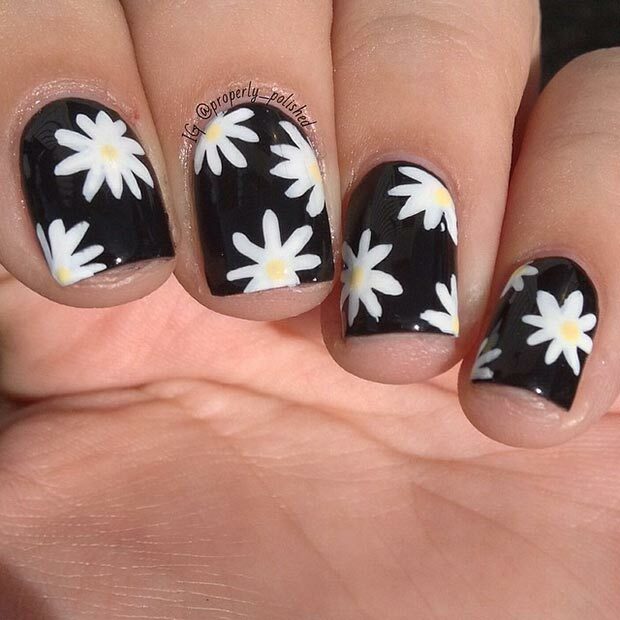 A floral nail design is the perfect boost to get you in the warm-weather spirit. 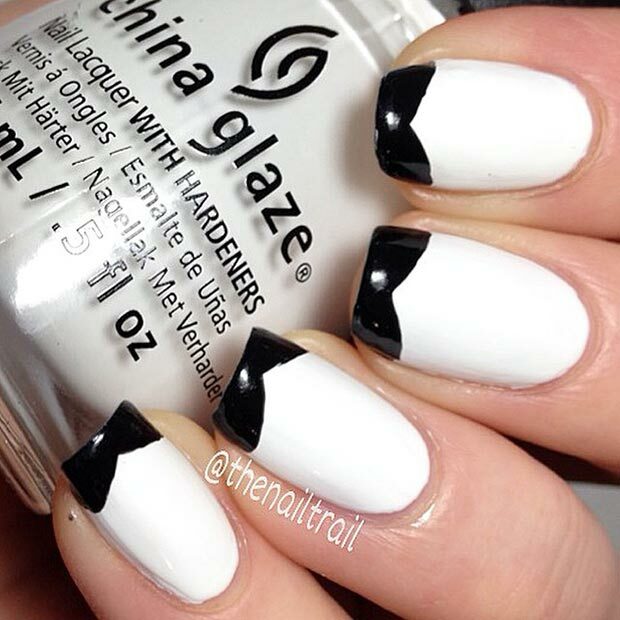 Without black stones on the white accent nail, this mani would be just the ordinary one. Small details can do wonders! This lovely nail design will bring music to your ears. 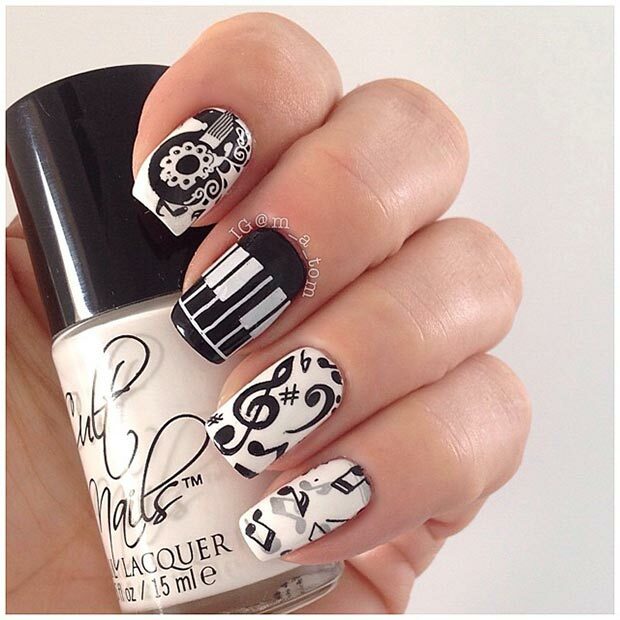 Perfect mani for all musicians out there. 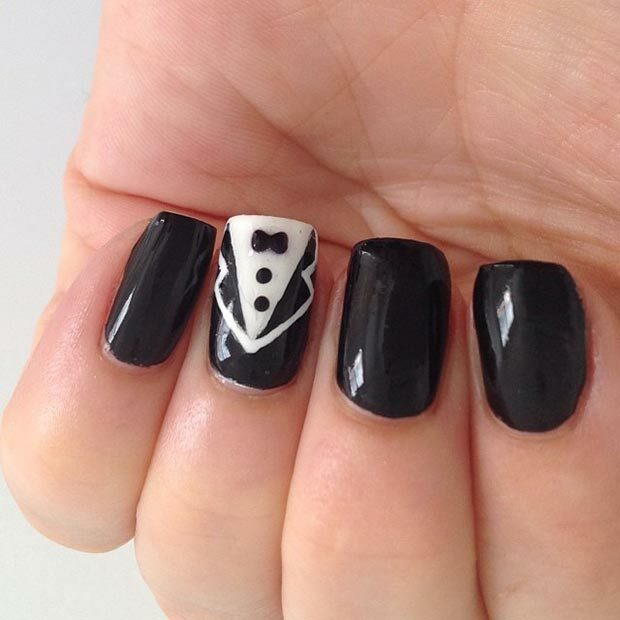 Suit and tie nail design is great, but it’s even more awesome in matte version. You can easily master this look with a little practice. There are so many different ways you can modify this interesting nail design – different shapes, different sizes, different colors, etc. Be creative! 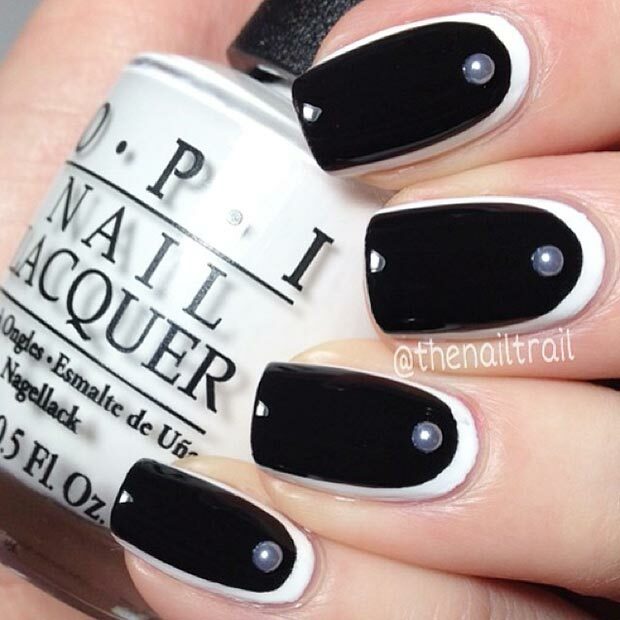 Adding pearls, stones or rhinestones to a black and white nail design is an easy way to add some glam without being over the top. 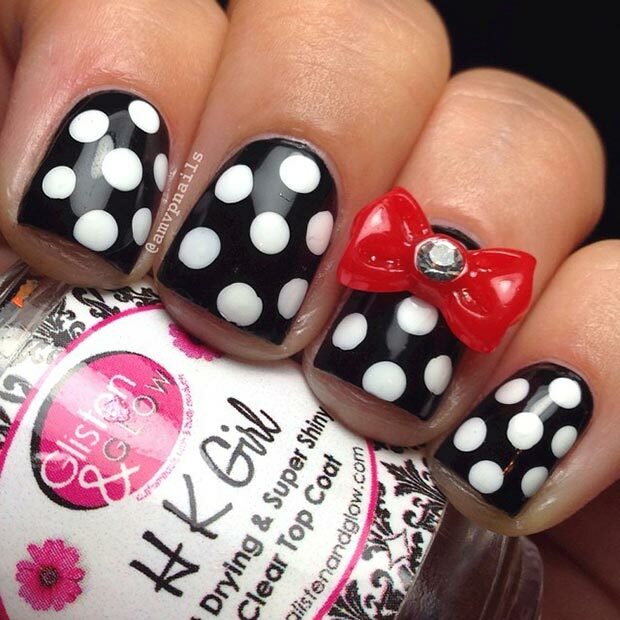 We love this simple polka dot nail design with a red bow on the accent nail. Easy and cute! 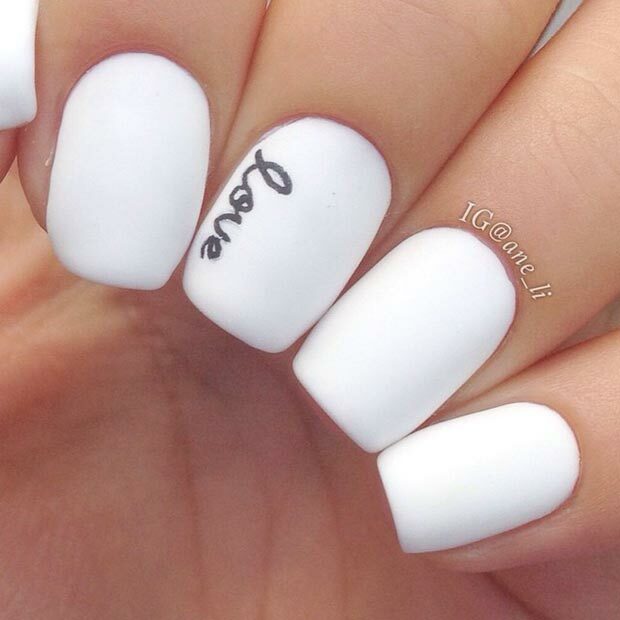 This is a simple nail design that we want to copy right away! Besides word ‘love’, you can write: fun, laugh, life, etc. 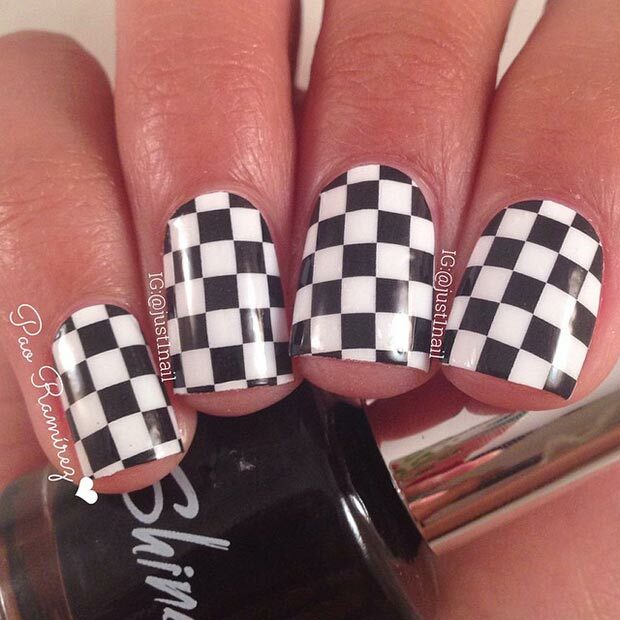 Checkered nail design can be easily achieved by using wraps. Your mani will still look natural and flawless. 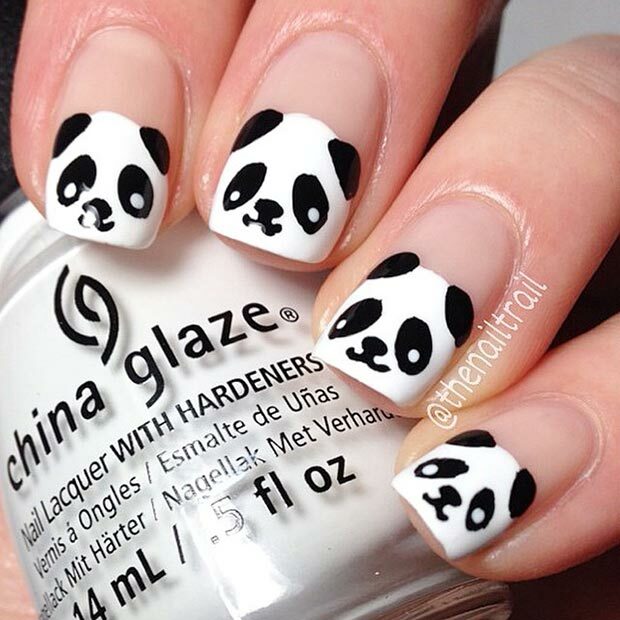 Panda nails are one of those fun and adorable looks for your nails. 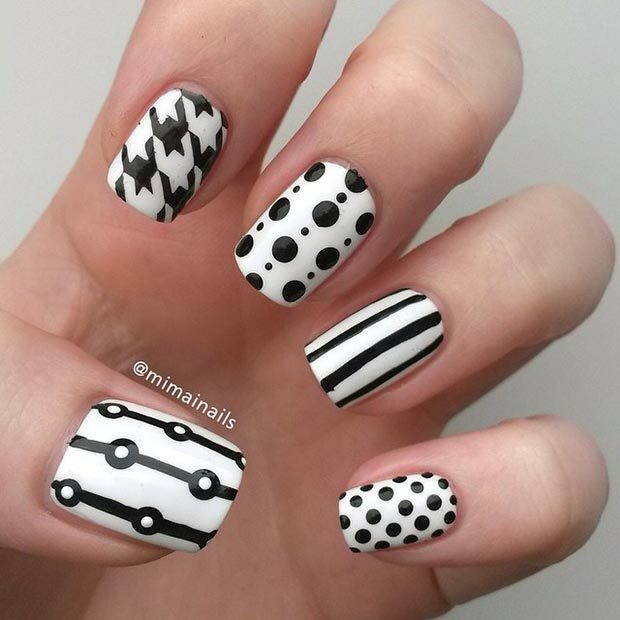 Black and white nail polishes can create some pretty interesting designs. This is one of them. When you cannot decide for only pattern, there’s no other way then using them all! Every nail will have it’s own design and personality. Lovely! The best way to cheat on your test without getting caught? 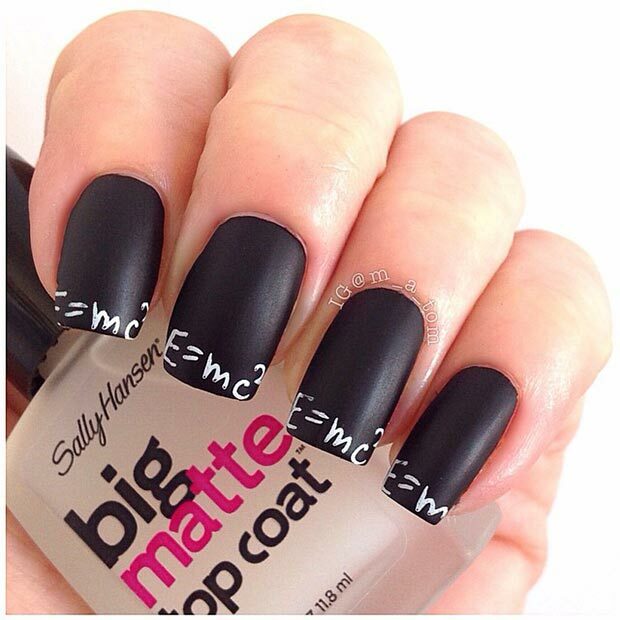 Wrote the formula on your nails! This nail design is inspired by henna, non-permanent tattoo that’s used as skin adornment in the Middle East, South Asia and North Africa. Stamping your nails isn’t hard, it just takes a little practice. This stamped nail design is additionally decorated with Swarovski rhinestones. 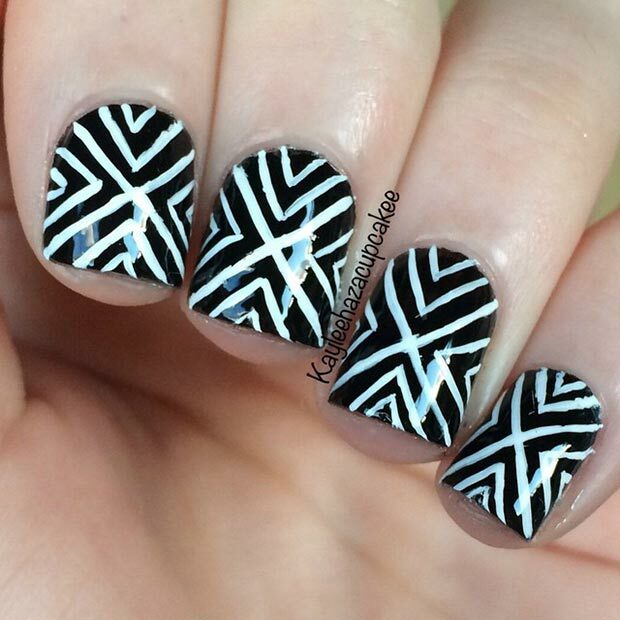 Use tape to get even and clean sides of black and white polish. Add nail studs in gold to make them pop even more. 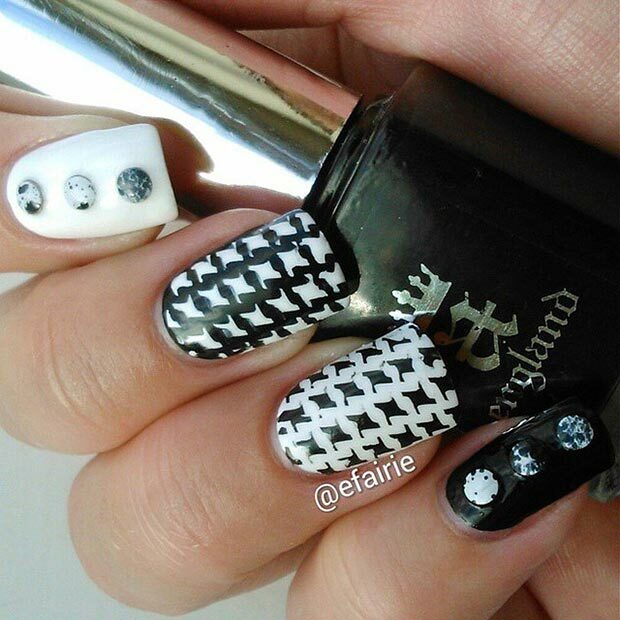 This unique nail design was created with spike vinyls. Nail shields and vinyls can be used to create fun and easy designs. 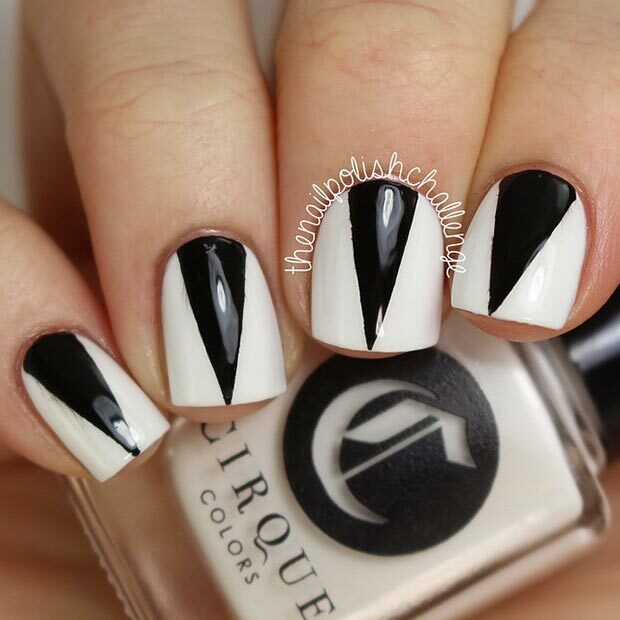 This triangle manicure is the perfect way to rock trendy geometrical designs. Another version of geometrical design but this time with nail rhinestones for some glam and shine. 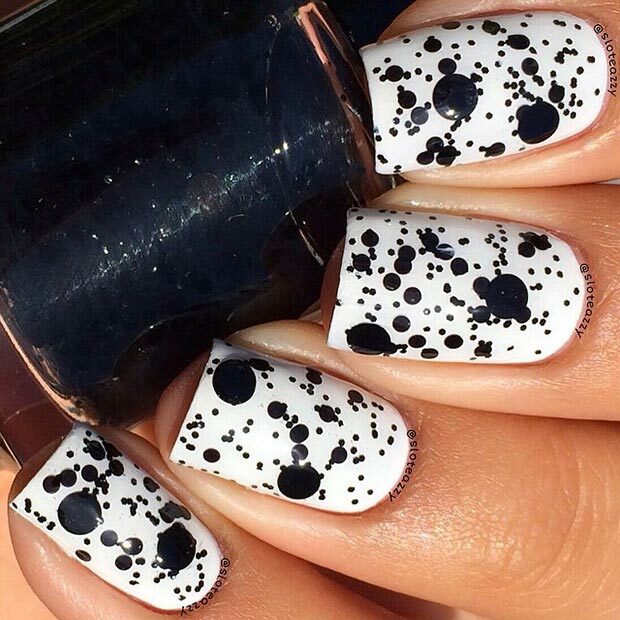 Pair a glossy black polish with a matte white for a trendy look. Jazz up your winter outfit with these cute and easy textured nails. This white tipped manicure is a subtle nail design for any occasion and everyday wear. 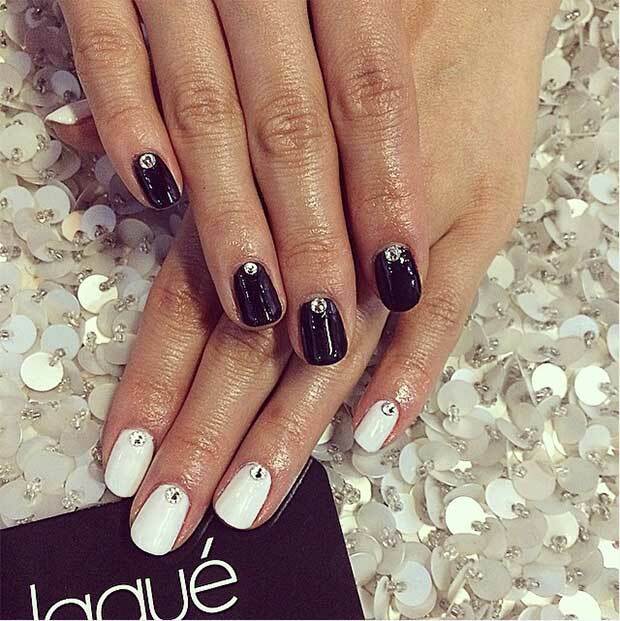 Negative space nails are the new nail trend. This lovely, elegant design blends a clear base with a swirl effect on the top. Apply a base coat in black (or white color) and let it dry. Start by drawing X in the middle of your nail. On each side of the X, draw two other parts. Done! 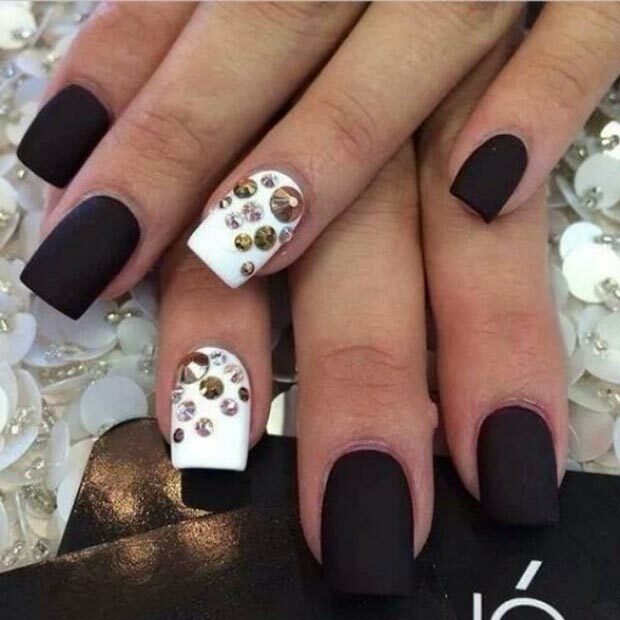 Although short nails don’t offer much space for nail design, this mani is a proof that women with short nails can also rock some interesting and complex nail designs. 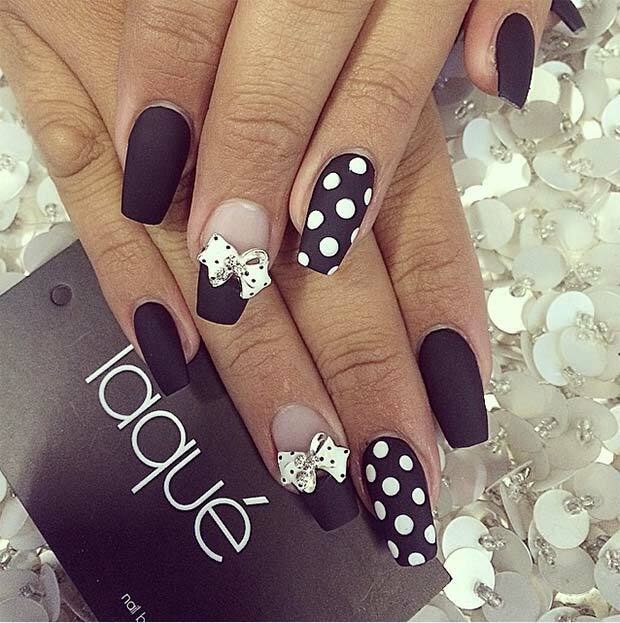 Check out our other article with 80 nail designs for short nails – they’ll surely inspire you. A floral design with gold studs is a cute accent for shorter styles. With a black base coat, possibilities are endless. 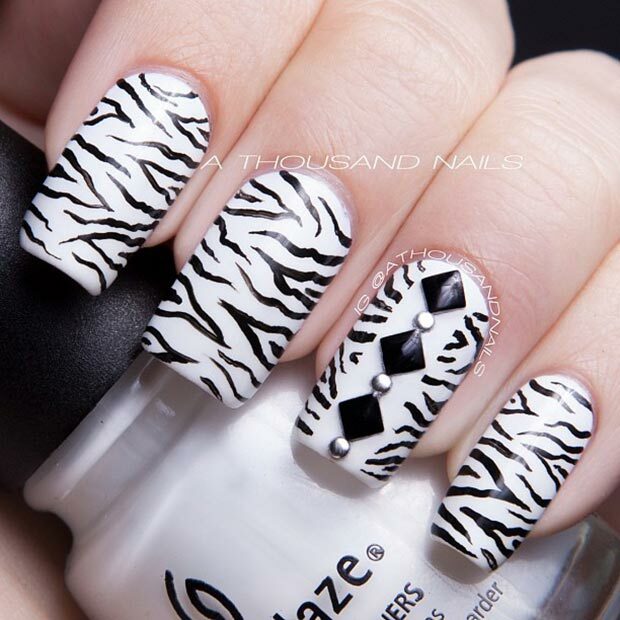 Cheetah nails are always trendy, especially in black and white. 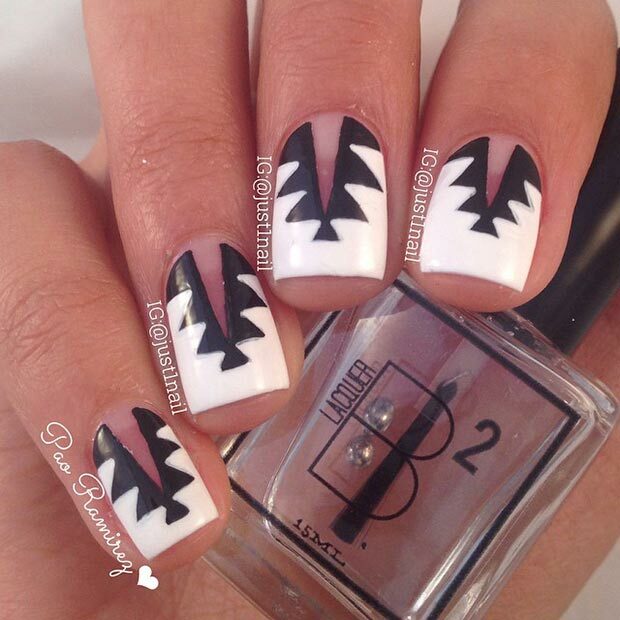 This nail design has been around for some time and we really like it. 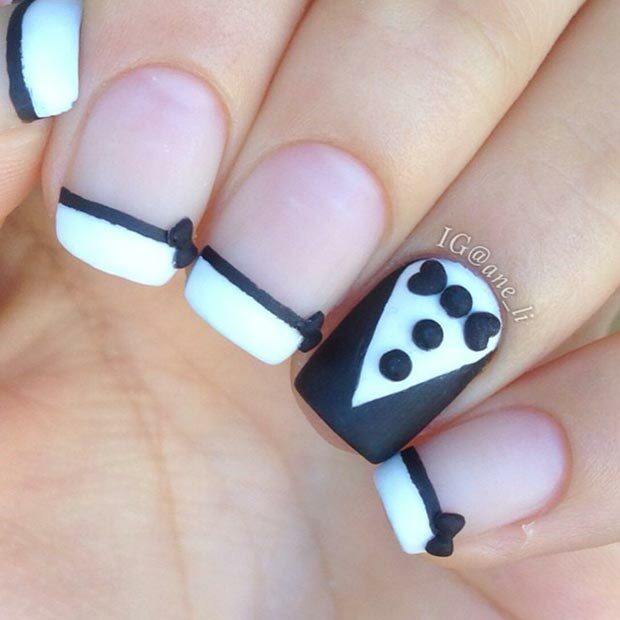 Another version of suit and tie nail design. This one doesn’t require a lot of time because you only need to do the accent nail. 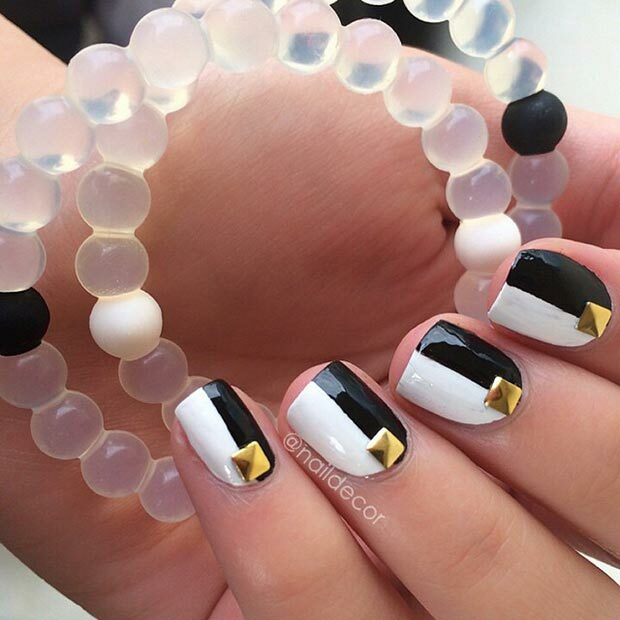 When you’re in a hurry but you decided to rock black and white nails, we recommend this super easy and simple idea. It might look even better in matte version. Try it! 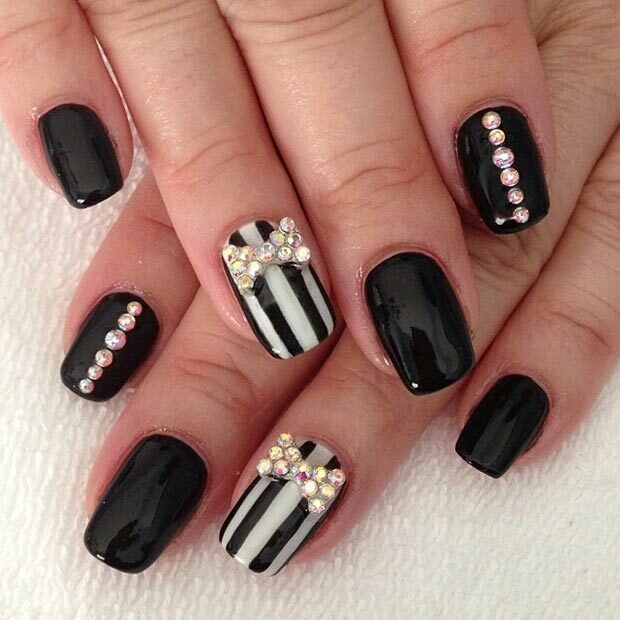 Keep it classy with striped accent nails and few shiny rhinestones. 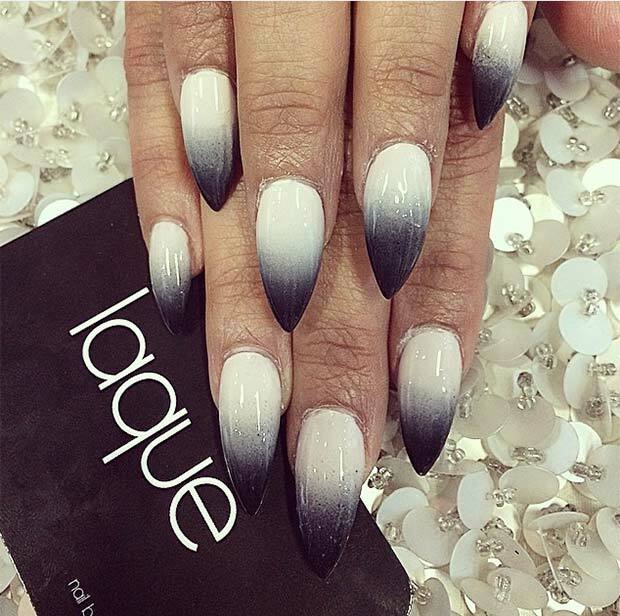 This nail design is a gorgeous and fashionable way to rock two of the 2015’s hottest trends: matte and monochrome. This nail design is suitable for beginners – simple, easy to make and gorgeous! i like number 47. i love it so much.